Visit the page here for the latest event. 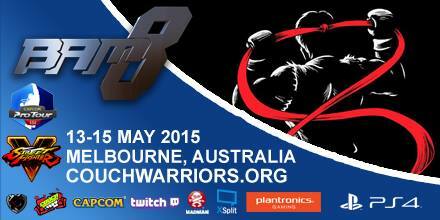 Australia’s largest fighting game major Battle Arena Melbourne (#BAM9) returns for the 9th time on May 12-14 – this year is BIG BAM!. BIG BAM will be held at a world class venue in the heart of Melbourne CBD – the Melbourne Convention and Exhibition Centre (MCEC), right next to Crown. With a venue three times the size of last year and running 3 days Friday to Sunday, BAM9 will be a gaming conglomeration featuring FGC tournament hype, casuals and exhibitions, merchant and vendor booths, cosplay competition, potential hands on access to upcoming games, and more. Pre-registration is $50 for venue entry and will close on April 30th- on the day entry will be $60. Registration for Smash WiiU and Melee is pre-registration only. All other on-the-day registration for games must be done one hour before the game’s first pool starts. Except for SFV and GG – their on-the-day sign-ups will close on Friday night because their first pools start on Saturday 10AM. If you wish to join the event as a spectator, you are more than welcome! It’s only $20 to take in the event. Doors open at Melbourne Convention and Entertainment Center on Friday at 4:00 PM. passes (competitor or spectator) to have access into the Tournament Area. This will also be the place you pick up any compendium item’s purchased! There are a number of unfinalized Melee / Wii U doubles teams, and a large amount of Street Fighter 3v3 teams. Please view the following knowledge article from Smash.gg in regards to creating and/or joining teams. Please bear in mind if you take public transport to observe the relevant public transport laws and regulations. – A huge range of international guests for Smash Bros such as Nakat, with Daigo, Infiltration, Xian and Momochi confirmed for SFV, Saint for Tekken 7. – Friday Night SFV 3v3 Teams back by popular request!